ONE of Northern Ireland’s most influential medical figures today denied that the death of Lucy Crawford had featured in a major review into the use of fluids here – and said he could not explain why he’d said in a TV interview that it had. John Jenkins told the" inquiry into the death of Lucy and other children from fluid overload in hospitals here that specific cases had not been discussed by the Chief Medical Officer’s working group on the subject – a position the inquiry chair, Mr Justice O’Hara said he found “curious” – but which Dr Jenkins said occurred in other working groups he had sat on. Dr Jenkins maintained that, at the time the group was at work – late 2001 – he had only heard, in vague terms, about the death of nine year-old Raychel Ferguson at Derry’s Altnagelvin Hospital in June of that year. Raychel died the year after 17 month-old Lucy and her death was reported to the coroner at that time. The cause of Lucy’s death, however, was not reported to the coroner or acknowledged with her parents until 2003. The inquiry also heard how Dr Jenkins had come to draw up reports into both deaths at the request of each trust’s legal representatives, the HSC’s Directorate of Legal Services (DLS) – for litigation in Lucy’s case in 2002 and for the inquest in Raychel’s in late 2002 and early 2003. The inquiry heard how the documents he received for Raychel’s case included a draft press statement prepared for the trust. Dr Jenkins had also been given another medical expert report written by a Dublin-based Paediatric Anaesthetist, Dr Declan Warde – which the inquiry has already heard was never introduced into evidence – and asked to provide any views “which might assist the trust”. Mr Justice O’Hara: I will put you on notice that I’ll also consider the fact that he [Dr Jenkins] is briefed with a misleading press release. How that finds its way into an expert’s brief is entirely beyond me … then he’s written to later on and is asked if he has any further point which he thinks can assist the trust. There’s nothing independent about an expert being asked for a report and if he can think of anything more which will assist the trust to go to an inquest. … I’m putting you on notice that I am very concerned about this morning’s evidence. Dr Jenkins, who retired in 2010, had been a senior lecturer in child health at Queen’s University School of Medicine, and a leading figure in the General Medical Council here – the organisation which registers and regulates doctors. He was also chair of the GMC’s UK-wide standards and ethics committee in 2005. At today’s hearing in Banbridge he was shown a transcript of an interview in June 2004 for UTV’s documentary about the children’s deaths, where he was asked about the working group and where he referred to two cases: Lucy Crawford and Raychel Ferguson. Dr Jenkins’ position was that in 2001 he was aware of Raychel’s case – in terms of it being a death in Altnagelvin in 2001. Shown documents from that period which reflected awareness of more than one death, he said he had been unaware of them and was focused on the single case he knew about. He said he was also completely unaware of the death of Adam Strain – who died at the Royal Belfast Hospital for Sick Children in 1995 and which a coroner’s inquest the following year established had been caused by the same condition as Raychel and Lucy: hyponatraemia. In February 2002 – after the working group had produced guidelines – he became aware of Lucy’s death because her parents were in the process of suing the trust involved – the then Sperrin Lakeland Trust – and he had been asked by the trust’s legal representatives to provide a medico-legal report into what had happened. In that report, he referred to recent concerns about Solution 18 – the dextrose fluid used with Raychel and Lucy – and said “a number of cases had resulted in brain damage or death”. This, he told the inquiry, referred to the one death he was aware of and others referred to in medical journal literature. He also said he “felt no need” to tell anyone about Lucy’s death and considered it would be a breach of confidentiality to have done so. He said he was also unaware that there had been no inquest into Lucy’s death. The CMO’s guidelines had gone into circulation in March 2002 with a cover letter warning that hyponatraemia – the condition of low sodium in the bloodstream caused by excessive fluid – “can be extremely serious and has in the past few years been responsible for two deaths in Northern Ireland”. Questioned by Counsel to the Inquiry, John Stewart, Dr Jenkins said he assumed this referred to Raychel and Lucy. Mr Stewart: Did you think how the Chief Medical Officer might have come by the information in relation to Lucy? Dr Jenkins was also challenged about his independence in taking on the role of providing a report into Raychel’s death, given that he had sat on the working group with Dr Geoff Nesbitt of Altnagelvin Hospital. Mr Stewart: Did you feel in any sense you weren’t sufficiently independent to do a report on this case? Mr Justice O’Hara: I think with the unfortunate question about the inclusion of that document in the brief, you were being given the Altnagelvin line at the same time of being asked to produce an objective, independent expert report. Do you agree that would be inappropriate? Dr Jenkins: Yes … but can I say I did not take any notice of that in preparing my report? Dr Jenkins produced three documents on Raychel’s case. In the first report he asked for more information about Raychel’s level of sickness – a crucial aspect of the case – but did not receive it. His report also stated “Solution 18 has been routinely used in paediatric medical practice for a very long time and is rarely associated with any acute electrolyte disturbances as were seen in this tragic case”. Mr Stewart: In your report in Lucy’s case, you had drawn attention to the death and cerebral damage; Why did you not make that caveat to this comment? Dr Jenkins: I think I was trying to make the distinction between paediatric medical practice and the surgical environment … that’s why I was emphasising that point. Dr Jenkins report also stated that many paediatric units had used Solution 18 until further concerns were raised in September 2001 “as a result of two deaths”. Dr Jenkins: The two deaths were Raychel and Lucy, although with retrospect, I believe Lucy’s death was not known to the Department [of health]. A line of Dr Jenkins’ first report – that it was possible to agree with Dr Sumner about Rayche’s severe and prolonged vomiting – had been removed in his final version, the one which was submitted to the coroner. Dr Jenkins also made no reference to another expert report he was provided with by DLS: Dr Warde’s, along with a request to raise points which may help the trust. Dr Jenkins said he understood it to be within the remit of the trust to make such requests and he later told the inquiry that he’d been told to concentrate on the aspects of the development of the guidance on fluid management which followed Raychel’s death. Dr Jenkins: In my mind, my understanding was I was preparing a report for the trust in the context of an inquest, but not directly for the coroner. 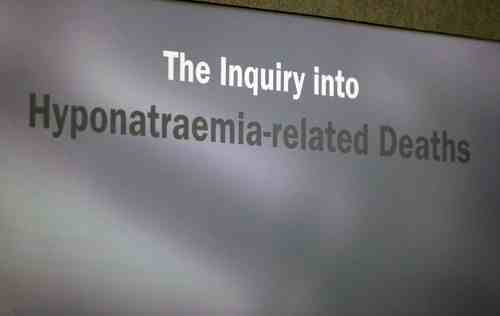 Dr Jenkins was also asked if he had attended a consultation with DLS which took place before Raychel’s inquest. Dr Jenkins: I have no record of having attended a consultation. I think that if I’d travelled to Belfast for a consultation, I would have kept a record of that. Mr Stewart: Did it surprise you that someone from DLS is advising you, an independent expert, what to put in your report? Dr Jenkins: My understanding is that it was within their rights. Mr Stewart: Were you asked not to refer to Dr Warde’s report? Dr Jenkins: I don’t know. I don’t have a recollection of that." Mr Stewart: Why does your third report omit reference to the vomiting? Dr Jenkins: In my mind this was an issue I couldn’t take any further. I’d given an opinion on those aspects I’d been asked to give an opinion on. Dr Jenkins was also shown notes of witness testimony at Raychel’s inquest, including comments by Dr Sumner that learning from “the 1996 death” [Adam Strain] had not been learnt because information was not disseminated. Dr Jenkins: When he referred to ’96 it went completely over my head. I was completely unaware of Adam Strain. I only knew of two deaths; I though it was Lucy.